Ever thought about adding photos and faces to your glass work? Well, now you can! You'l be shown how to add painted imagery quickly and easily using screen printing, the same technique used in printing on t-shirts. Wait till you see how easy it is t get started! You'll be able to add realism and imagery to your stained, fused, or mosaic projects using this innovative technique. 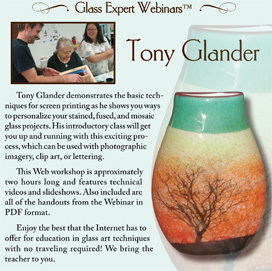 Tony covers equipment, image development, kiln firing, and more! You'll learn how to create a computer generated image, and how to fabricate the stencil that you'll use to print your design on glass. This simple introductory class will get you up and running in no time! Use it with photographic imagery, clip art, or lettering. Print the images once, or again and again! This is a DATA DVD. Play it on your COMPUTER. Use RealPlayer, Adobe Media Player, VLC Player...all free downloads on the internet. Windows Media Player does not recognize the webinar file. Will play on Mac and Windows.